Should I first get a car or a property? Welcome to adulthood where life is about making decisions. Unless you are born with privileges, in most instances, you are responsible and accountable to your finances once you are done with college and have landed yourself a job. The question above is a common dilemma to most millennials living in the Klang Valley. If that is you, let me assure you that you are not alone and it takes a few tricks (that 90% wouldn’t know) in mind to work out a simple financial plan to get your dream car and dream property. One of the tricks is to know: The Rule of 200. Let me work out a simple illustration. For instance, we have John, a local boy in his 20s, earning a stable salary of RM 5,000 a month. In general, bankers want to calculate the maximum amount of your monthly debt servicing capability before lending money to you. The exact calculation varies from bank to bank and from time to time as it is determined based on the bank’s credit and risk management policies. But, you can make a rough estimation on it. Here, let us assume that John is assessed based on a debt-servicing ratio (DSR) of 60%. As such, his monthly debt services is estimated to be RM 3,000 at maximum. Guys, isn’t tempting to have the latest Honda Jazz or Mazda 2? If these two models are not your ‘thing’, I’m just referring to any car models where their price ranges between RM 80,000 – RM 100,000. Apparently, you may expect to fork out at least RM 1,100 in monthly instalments assuming that you put 10% down payment for the purchase of your car. Obviously, John is able to afford the Honda Jazz as RM 1,100 in instalments is within his maximum debt services of RM 3,000 a month. Then, he still has a balance of RM 1,900 a month where he can use it to shop for properties. 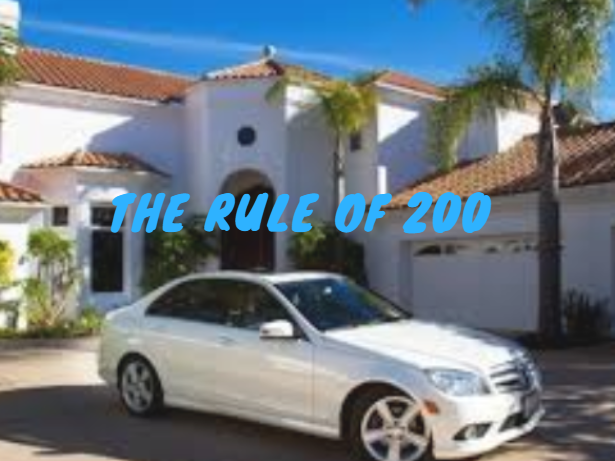 Now, we can apply the Rule of 200 which is used to calculate the maximum amount of property loan that he can obtain. By multiplying RM 1,900 with 200, John is able to apply for a maximum of RM 380,000 in mortgage. If he is buying his first property where the down payment is 10% of the property value, then, John is able to hunt for a property that is priced at a maximum of RM 422,222. So, what if John decides to secure a house first? Then, the maximum amount of mortgage that John can apply is RM 600,000. Instead of RM 422,222, he is able to shop for a property that is priced at a maximum of RM 666,667. So, what are the key differences between the two? If you are John, which of the two options would make you wealthier over time (not necessarily happier)? You have a RM 400k+ property that appreciates in value and a RM 90k+ car that depreciates in value. You have RM 600k+ property that appreciates in value. For example, John borrowed RM 81,000 to buy a Honda Jazz that is priced at RM 90,000 and expects to pay RM 1,100 in monthly instalment. Based on the Rule of 200, a property investor may view that the RM 1,100 is worth as much as RM 220,000 in property loan. Thus, if John decides to get his Honda Jazz, he is essentially forgoing RM 139,000 in borrowings which could be used for properties. Suffice to say, buying your dream car first has a definite impact on buying your dream home. With that said, I’m not asking you to forgo your aspirations to buy your dream car. Rather, for most, it is wise to defer and delay. For example, John decides to use his maximum debt services of RM 3,000 a month on properties. He can either choose to buy one RM 600k+ property or two RM 300k+ properties for investment purposes. Either case, if John is able to fetch 4% yield from his portfolio, John would be receiving RM 2,200 a month in rental income. The RM 2,200 would add up to John’s maximum debt services, which in turn, enables him to afford his dream car or his third property. Congratulations! You can shop around for your car as long as its monthly instalment is under RM 1,320. The price range for the car is around RM 100 – 110k. Are you salivating now? 2 replies to "The Rule of 200"
Shouldnt the property yield of 4% i.e. RM2200 have to be deducted by the loan installment as well? Great job on the article Ian.